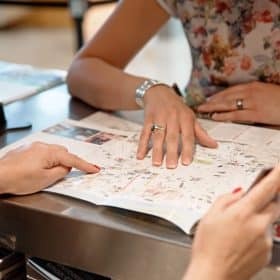 Below you will find advice for planning your cycling tour so you can head off with peace of mind and make the most of your holiday. If this is your first time cycle touring, start with short stages. Days of 30 to 40 km will be enough and will leave you time to discover the wealth of local scenery and heritage or do activities along the way. Allow for a speed of around 10 km/hour the first few days. Download an existing trip from the “route suggestions” section and modify it if desired. Create your own itinerary from the maps available. You can cycle along La Loire à Vélo from East to West or West to East. In both directions, the Loire reveals different facets and you will discover varying scenery. In addition, the various slopes are insignificant and suited to all abilities, with a height difference of just 190 m over more than 900 km. All the same, it is worth noting that prevailing westerly winds generally push tourists inland from the Ocean. Transporting your bike, luggage etc. You can transport your bikes or luggage in the train or have them transferred by a private transporter. 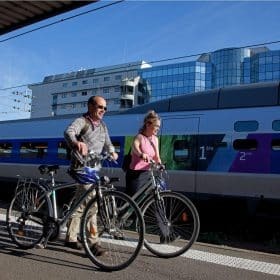 For more information, see the sections on Luggage, bikes and passenger transport – Train Vélo Loire – Regional TER trains and coaches. If you are travelling with children, adapt the distance to their ages. Target sections of the itinerary that offer a maximum amount of “traffic free” routes. Don’t overestimate your ability, or that of your children! All the accommodation presented on this website is committed to the “Accueil Vélo” approach, and each place is situated less than 5 km from the itinerary. There is a variety accommodation all along the route to cater for all tastes and budgets. In summer and on national holiday weekends in spring, or in places where the itinerary has a limited selection, it is best to book accommodation in advance. Between spring and autumn the weather is generally pleasant, perfect for enjoying the Loire Valley countryside! Check the weather before you leave so you can pack according to the forecast. Mother nature can be unpredictable, and certain sections of the itinerary may sometimes be cut off after very heavy rain. Check the “Route information” page to find out about the accessibility of the itinerary. To make your experience along La Loire à Vélo even more enjoyable, you can download GPS tracks of the itinerary to your smartphone using an application, or to a cycling satnav to guide you. The GPS tracks of La Loire à Vélo are available for free on the website. You can also buy one of the La Loire à Vélo guidebooks online, in bookstores and in some Tourist Offices along the way. For your comfort and safety, development and maintenance works are regularly carried out along the itinerary. To find out the latest updates, go to the “Route information” page. Alerts are published on the website to keep you informed of the itinerary’s accessibility. Check them before you leave. Where possible, a provisional route will be indicated if part of the itinerary is cut off. For your comfort and safety, the itinerary is signposted in both directions from Cuffy inland to Saint-Brevin-Les-Pins on the coast. All you need to do is follow the signs! There are enough signs in place to guide you all along the route. Some towns and cities can be a little more complicated to cross as you concentrate on the traffic while keeping an eye out for signposts. Please take care! For a journey lasting several days, choose a well-equipped all-road bike with a comfortable saddle, lights, rack and at least 21 gears. Check its condition and have it checked by a bike professional. Adjust it to your height, make sure the tyres are well pumped, check the brakes and don’t forget the bell! 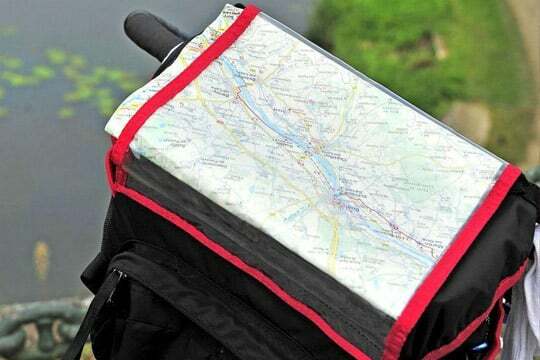 Consider a handlebar bag for your guidebook. Preferably use paniers rather than rucksacks, which become tiring over long periods. For infants, instead of a child seat, opt for a trailer or “third wheel” according to their age, since these are more comfortable and fun. Carry a small kit of repair essentials, with puncture equipment and two inner tubes per bike, a multi-tool, pump and the right nozzle for your valves. Don’t forget a padlock for stopping off in towns and cities! To find out what equipment is compulsory on a bicycle, visit the French Road Safety website. Comfortable clothes for cycling and suitable shoes. A jumper for the evenings. A sunhat or cap, sunglasses and sun cream. Windproof and waterproof coats, preferably made of breathable material suited to touring. For long journeys, we recommend using padded shorts, gloves and shoes for cycling. It is not obligatory to wear a helmet (except for children under 12) but it is strongly recommended. Carry water and energy bars to avoid getting overtired. Get a guidebook and/or download the GPS tracks to your smartphone or cycling satnav. Carry only what is necessary, don’t overload your bike! 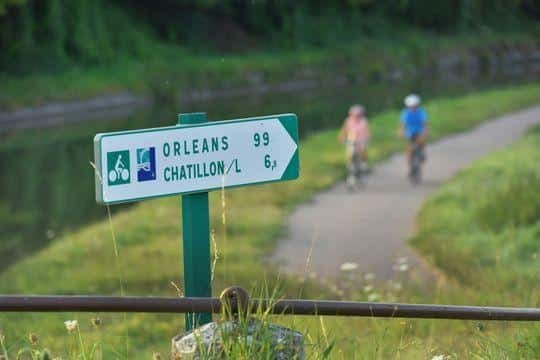 The La Loire à Vélo itinerary alternates between traffic-free sections, small quiet roads and cycle paths and lanes, particularly where it crosses towns and cities. There may be large numbers of cyclists along the route in certain periods, so please take care to respect the rules for your safety and others’ during your trip. Comply with the French Highway Code. Please note that any offence on a bike may result in a fine. To ride safely, you must imperatively have a well-equipped bike in good condition. All cyclists (and their passengers) riding outside of towns and cities are required to wear a certified reflective jacket at night or in conditions of poor visibility. It is compulsory to wear a helmet for children under 12 years, whether they are riders or passengers, as of 22 March 2017. Take care on roads and when crossing cities… especially at junctions and on bridges. On Green Lanes, give priority to pedestrians and alert people of your presence. Be fair to other users of La Loire à Vélo. The key word is conviviality above all else! 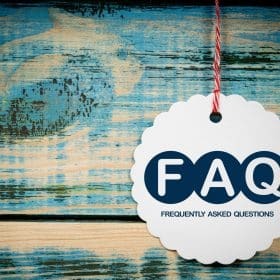 You will find all the information on the regulations concerning safety and bike equipment on the French Road Safety website. Please remember that you cycle at your own risk and are liable for accidents which you may cause to yourself or to a third party and resulting from behaviour not in compliance with the French Highway Code, or not suited to the conditions and reasonably expected dangers in a natural setting. It is COMPULSORY to have civil liability insurance. Be careful! It is forbidden to swim in the Loire and other rivers because it is dangerous, except in designated zones. If you want to swim, choose one of the supervised swimming areas. View the supervised swimming areas in the “On the water” section or directly on the map. Cycling is a means of transport with very limited environmental impact. There’s no CO2 on a bike! A bike trip is also the perfect way to discover the Loire Valley countryside and other gems at your own pace. 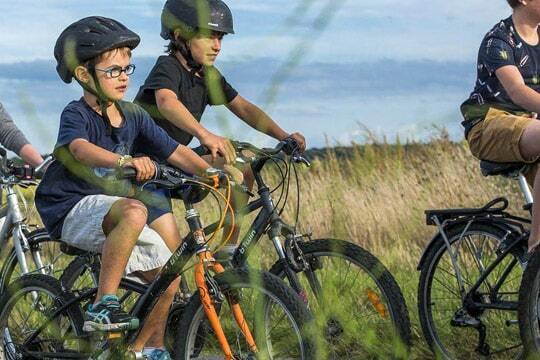 On La Loire à Vélo, you will experience a personal adventure in the midst of an unspoilt natural setting. 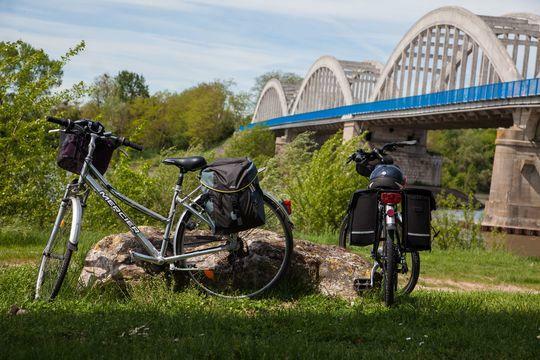 Below are a few tips to continue protecting the environment and encourage moments of sharing with other users on La Loire à Vélo, as well as for being an “eco-responsible cycle tourer”! Protect the local wildlife and pass on environmentally friendly actions. Stay on the signposted paths to avoid damaging the plant life. Use the bins provided all along the route for throwing away your rubbish. If there aren’t any, use your pockets or paniers to stow wrappers and other unwanted items. Respect the highway code and control your speed at all times. Give way to pedestrians, hikers and horse riders and encourage conviviality with other users above all else. Use the facilities provided along the itinerary with respect for the rules and recommendations. Opt for local and seasonal purchases (local produce, craftsmanship etc.) and promote the use of ecological products. Respect private property and crops. Respect the rules against wild camping, unless the owner gives you permission. And since we’re all concerned, if you have any good ideas, let us know!